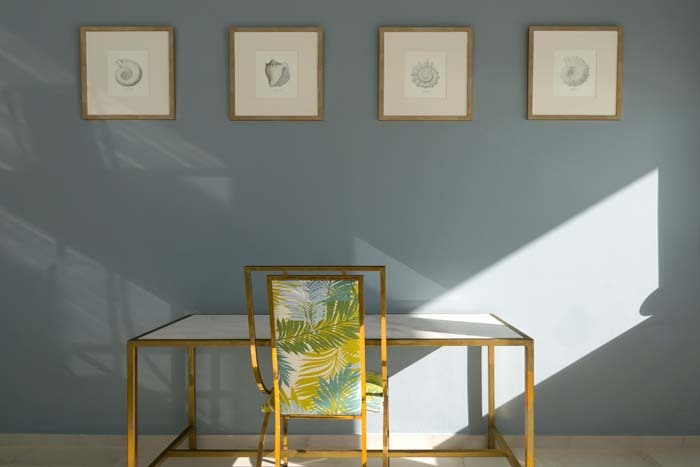 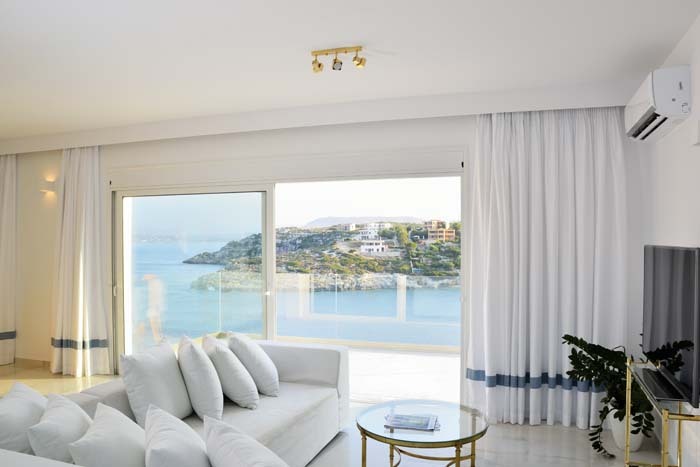 Villa Sea Breeze has a minimal yet eclectic style with touches of brass, gold and bold colors. 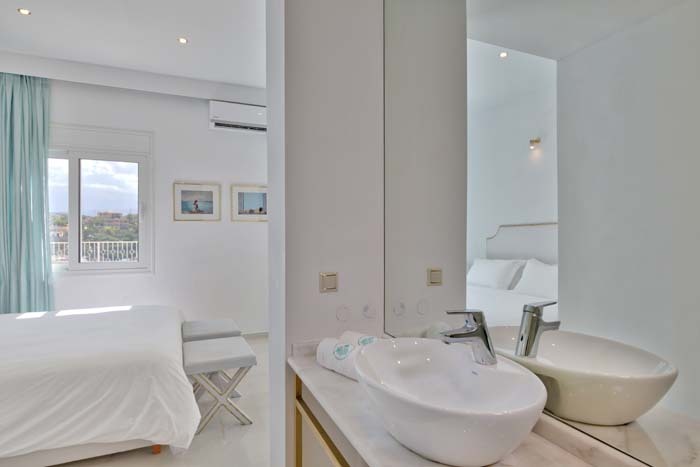 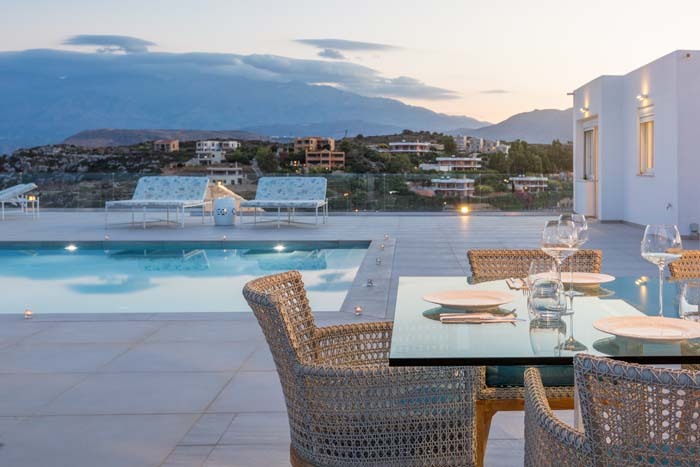 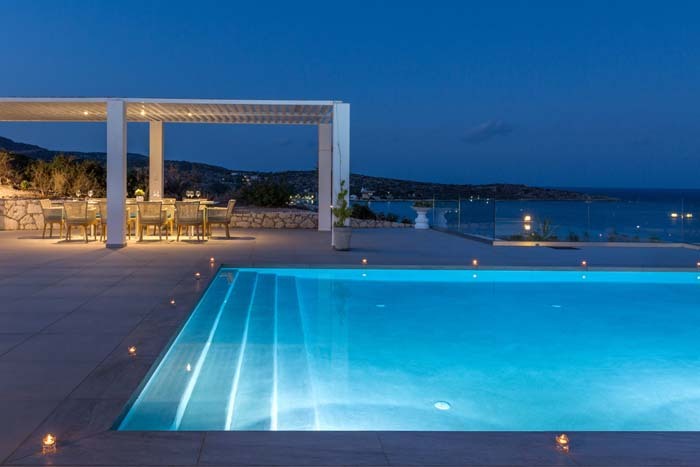 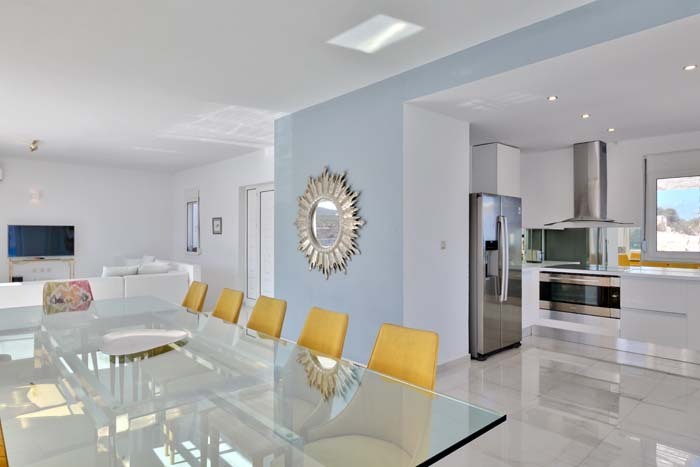 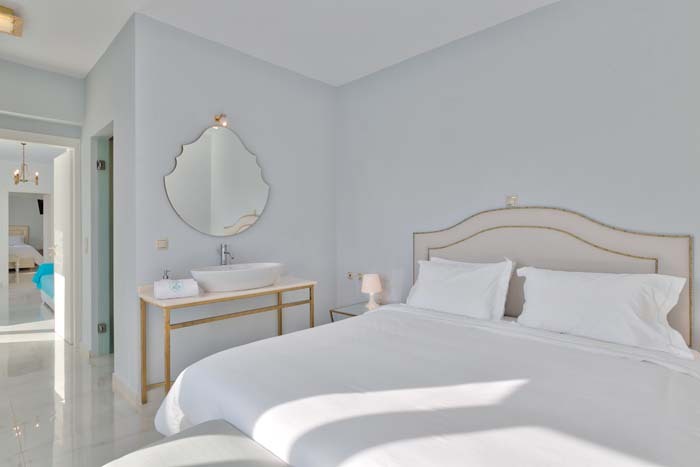 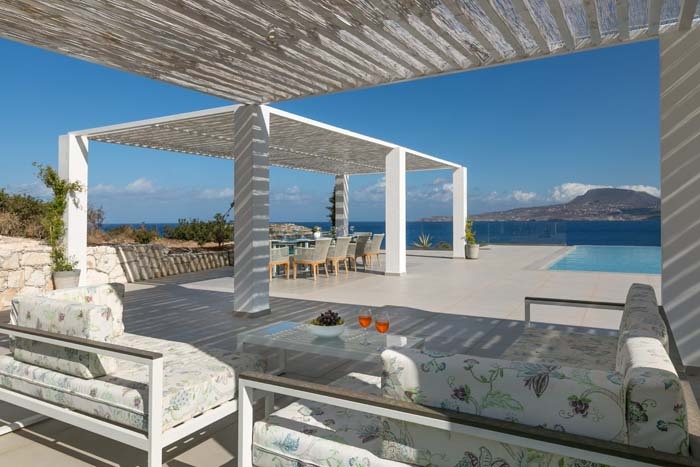 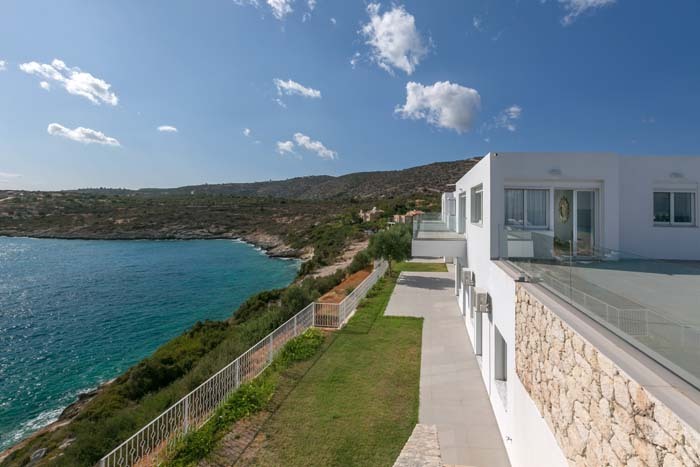 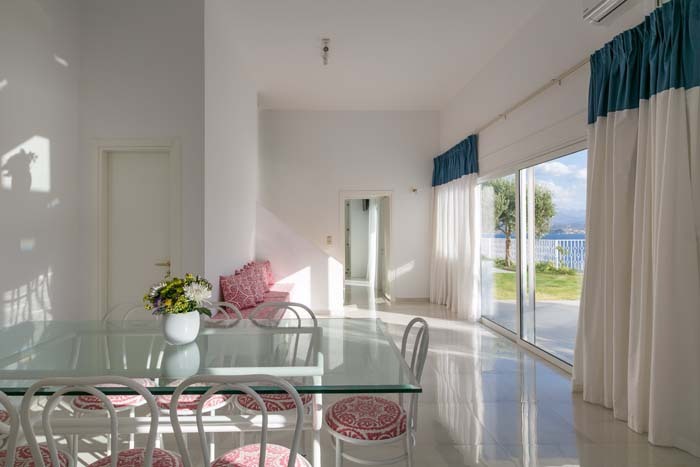 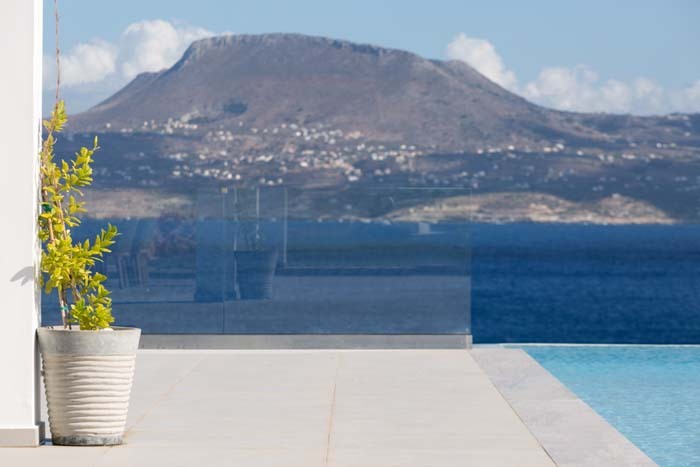 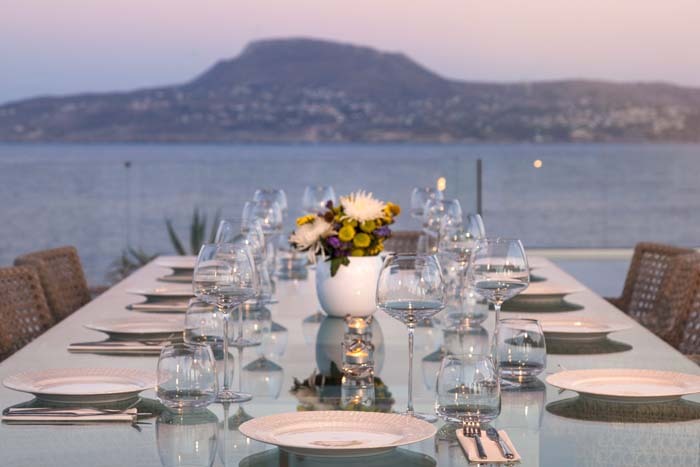 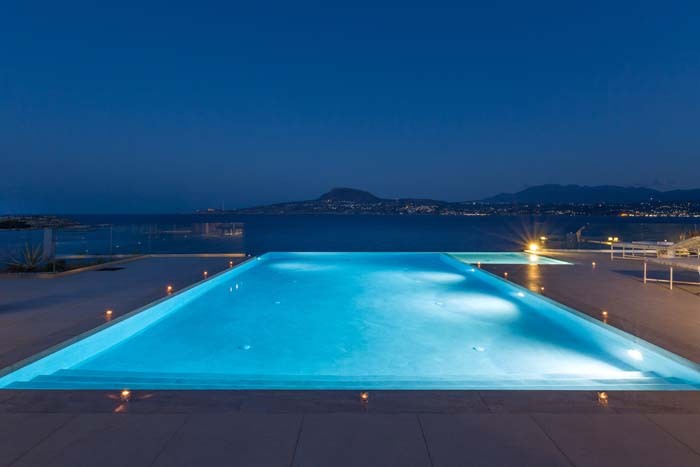 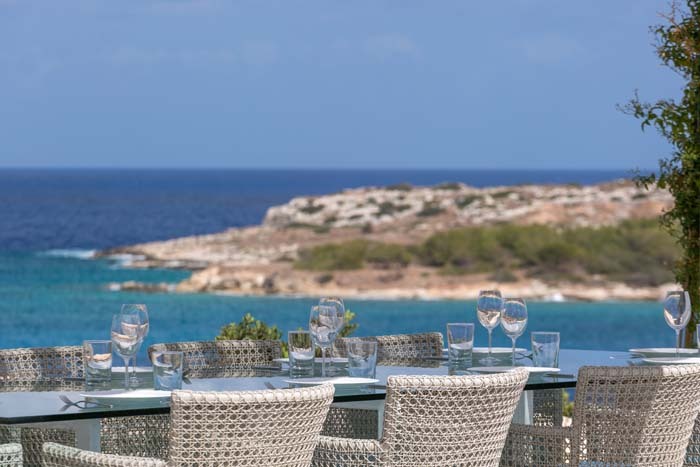 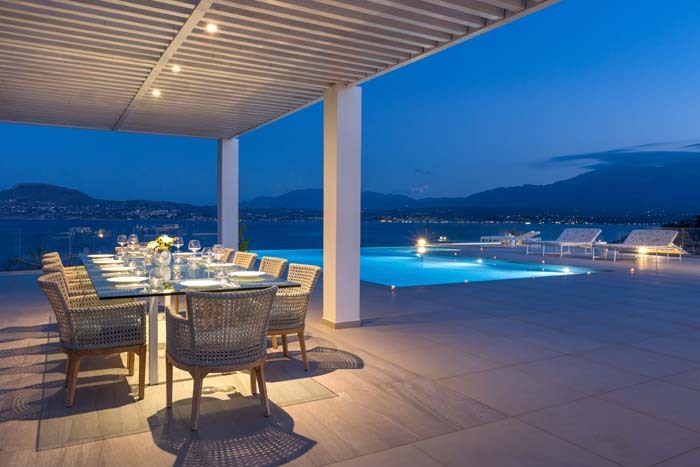 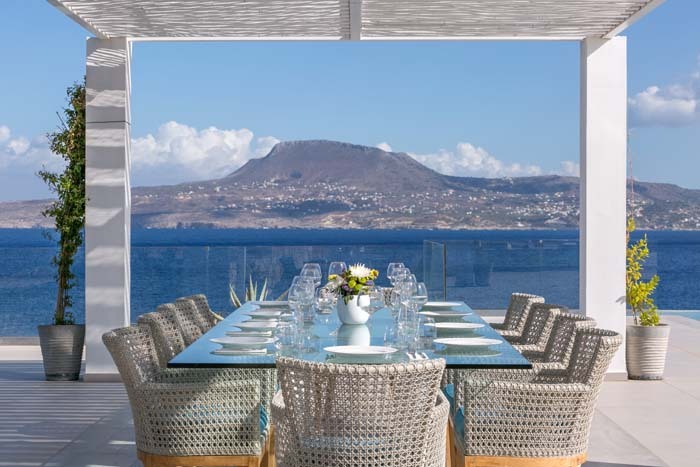 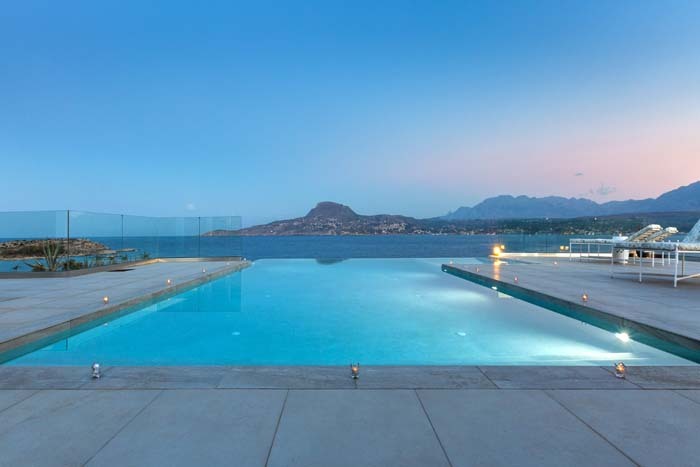 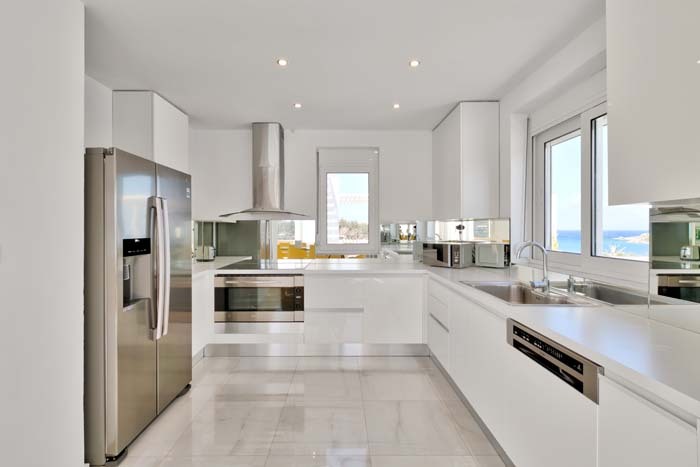 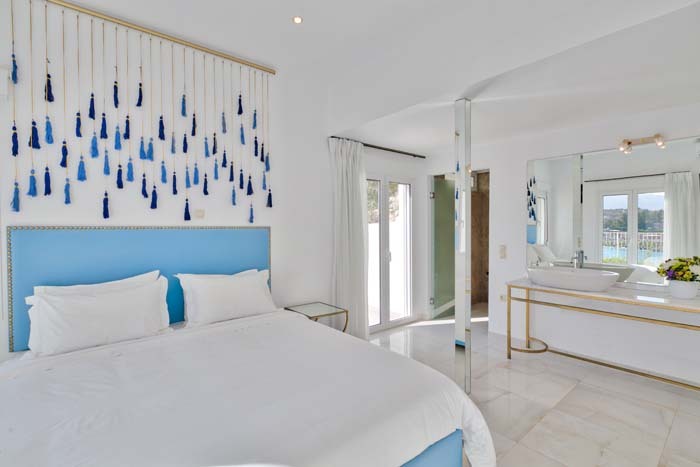 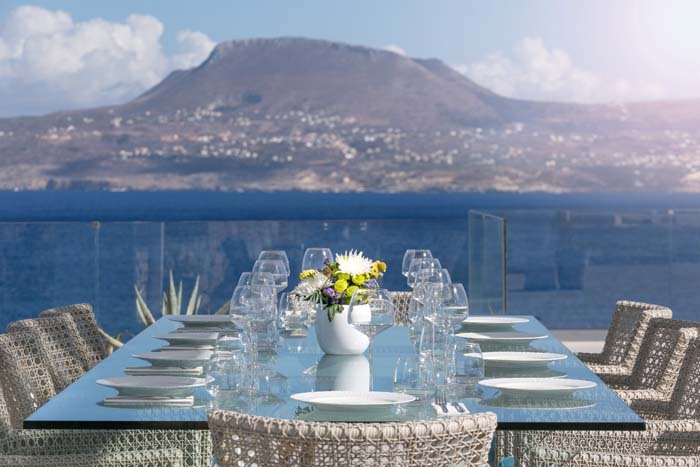 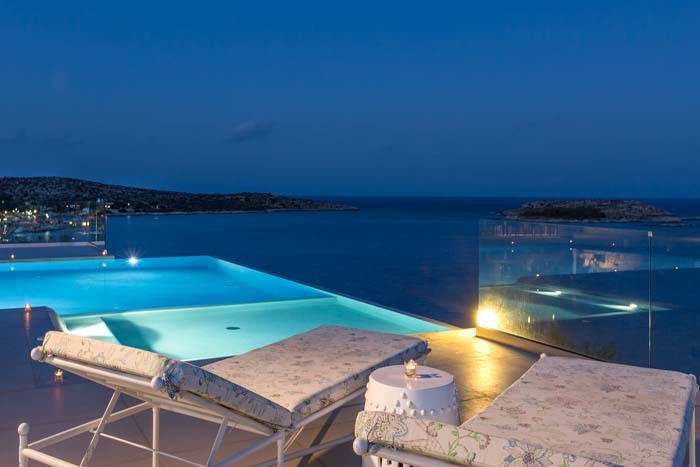 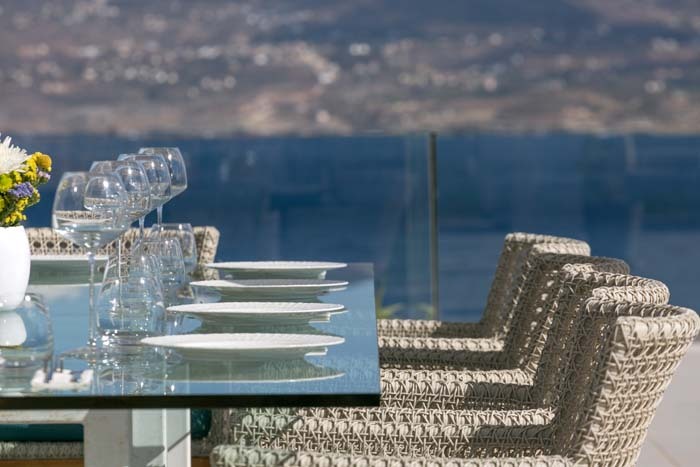 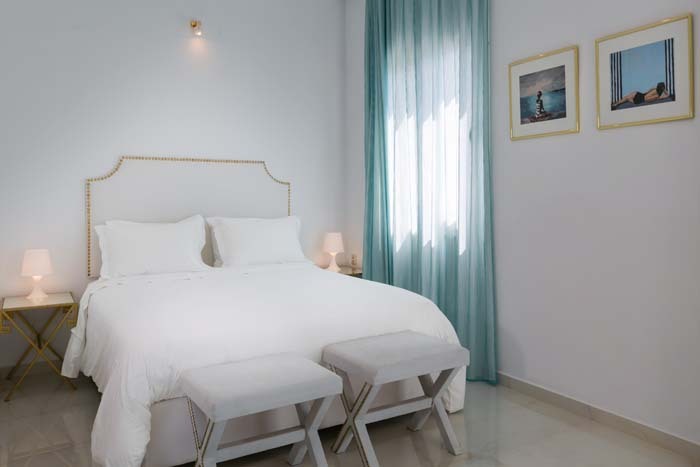 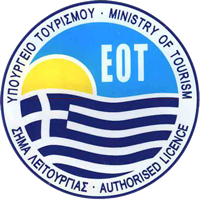 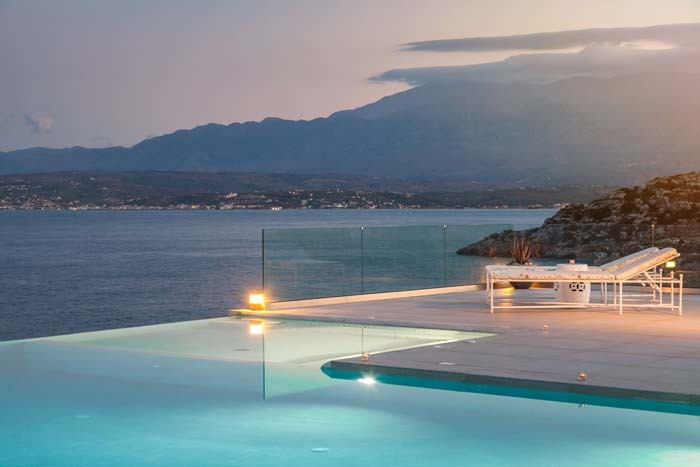 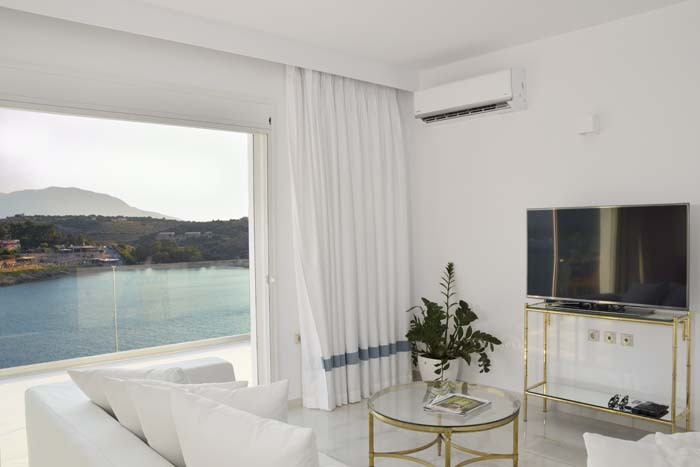 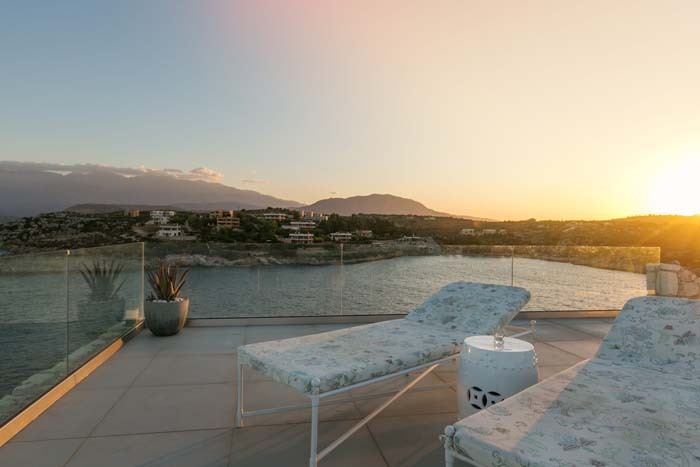 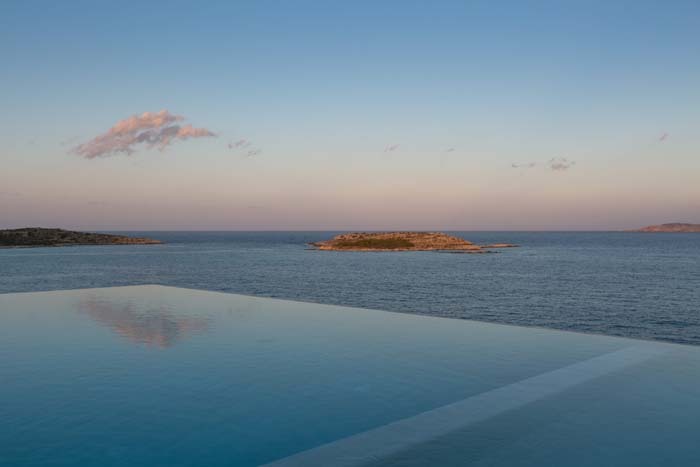 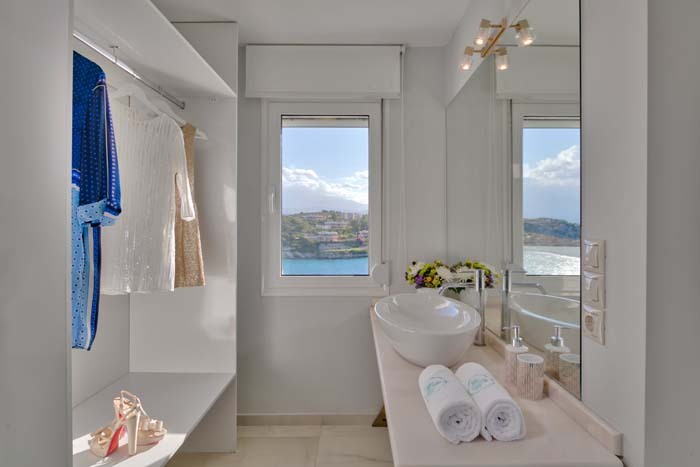 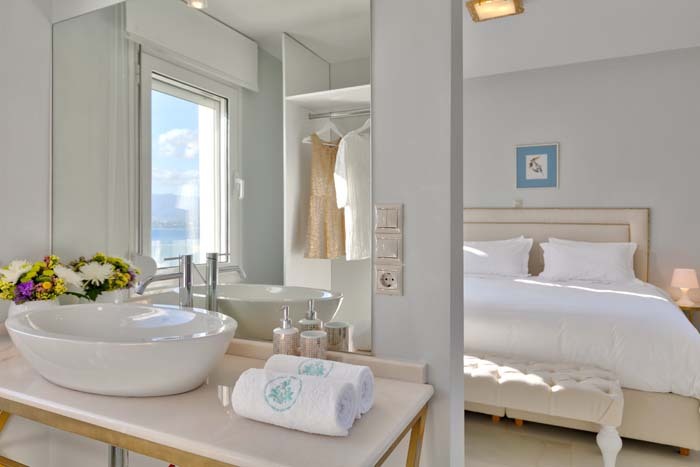 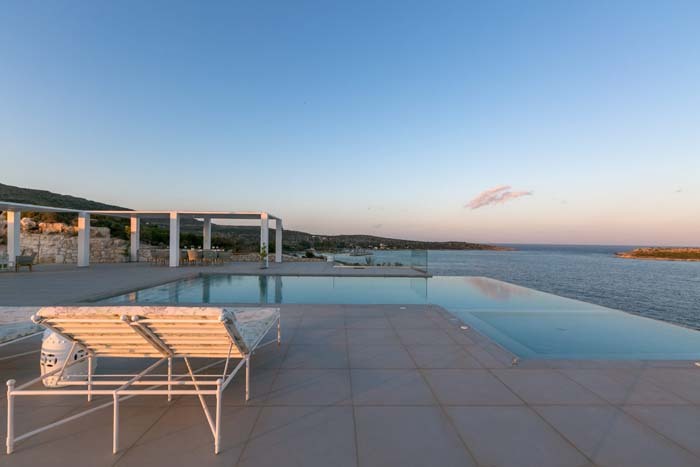 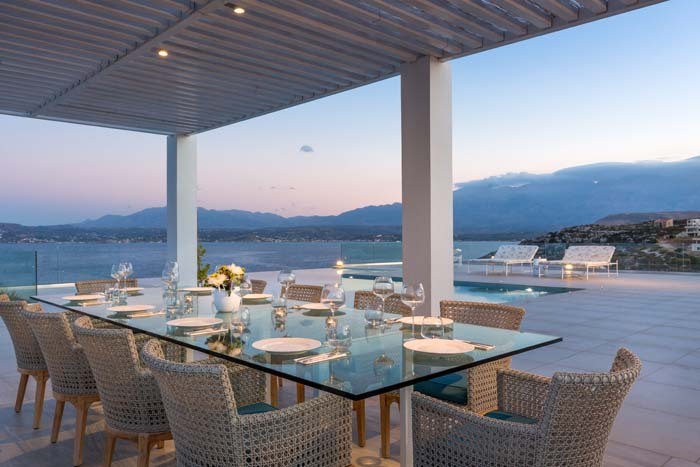 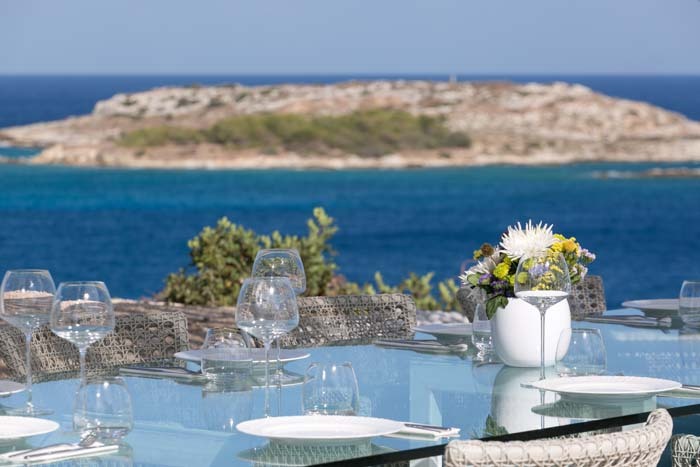 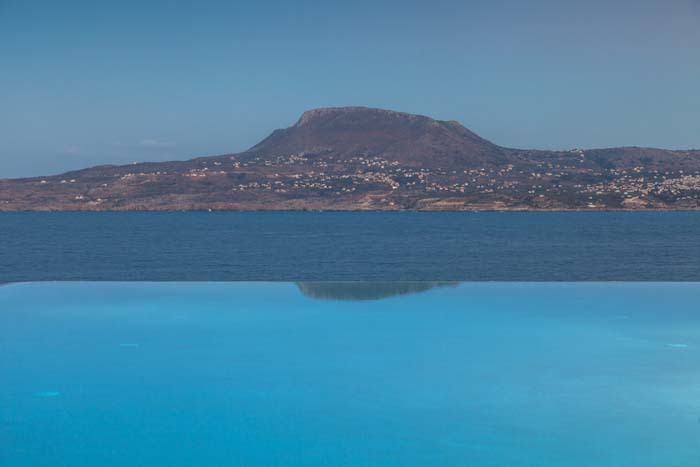 There is an all-white and mirror back-splashed kitchen, which is fully equipped, and a dining and sitting area with balconies offering amazing views of the Loutraki Bay. 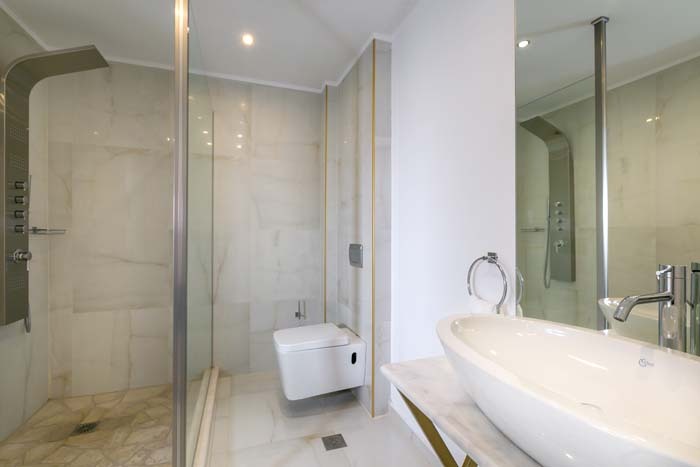 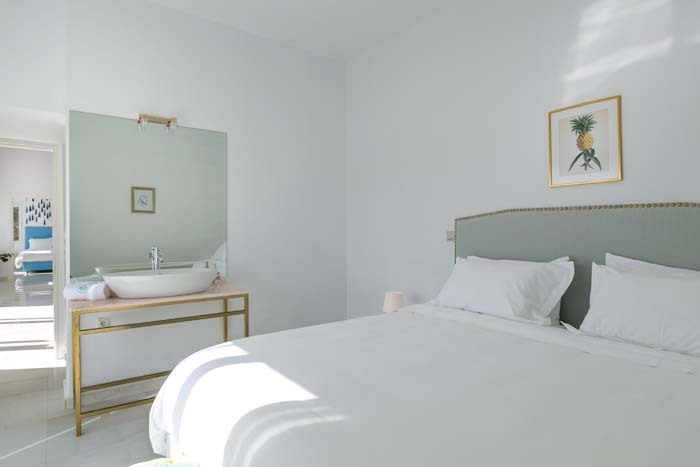 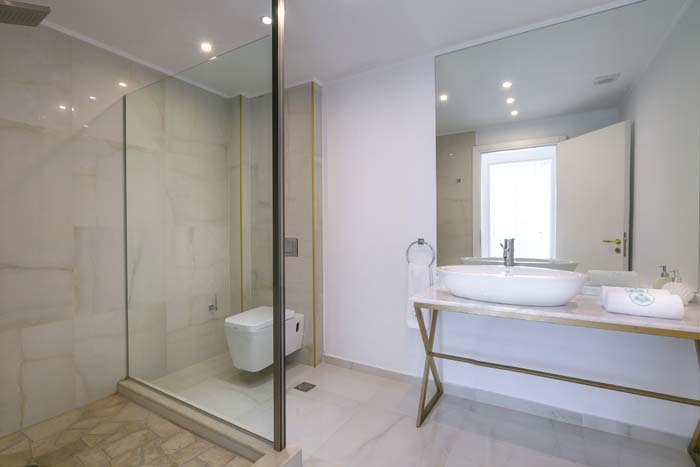 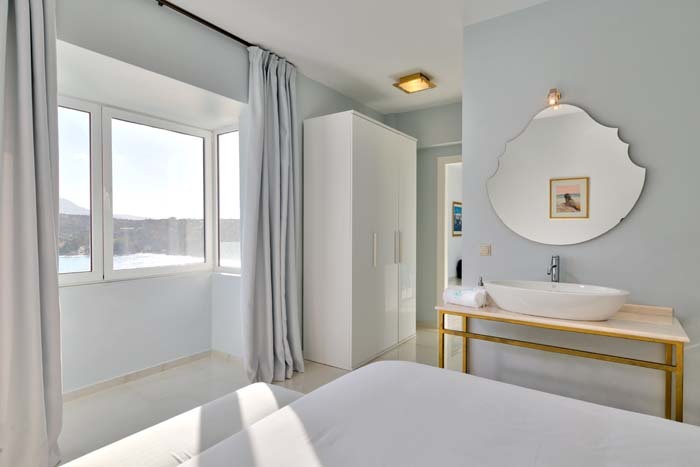 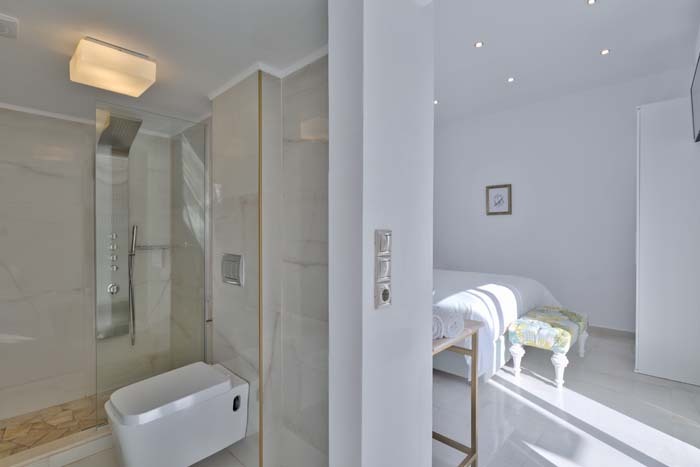 All six sleek bedrooms have ensuite granite-tiled bathrooms with Jacuzzi showers and washbasins resting on high-quality marble tops with gold trimmings. 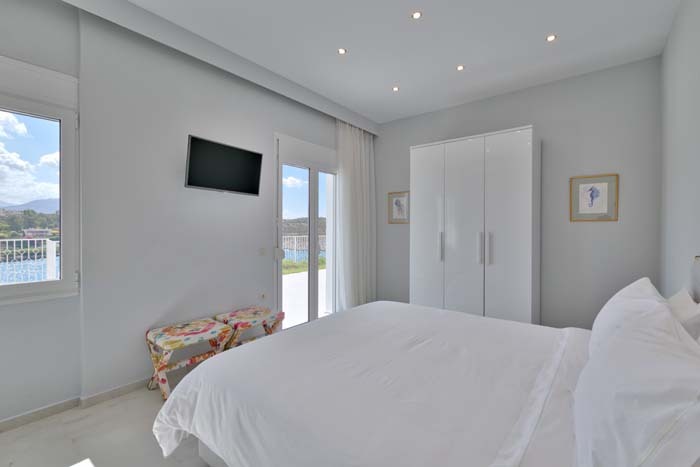 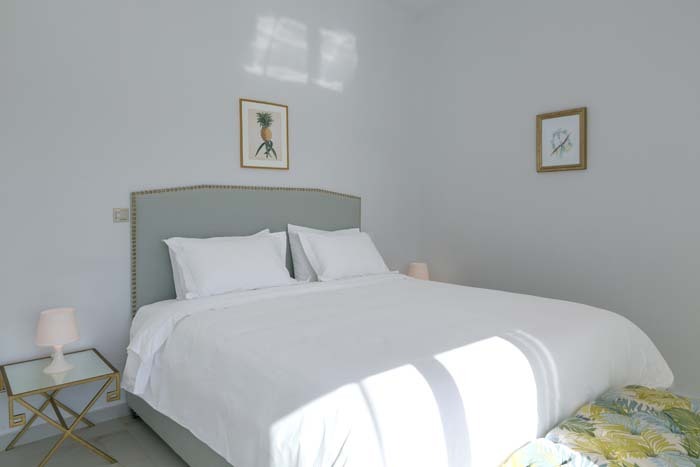 Depending on guests’ needs, two of the bedrooms can become twin or double while a sofa-bed in one of the three living rooms allows for an extra double bed. 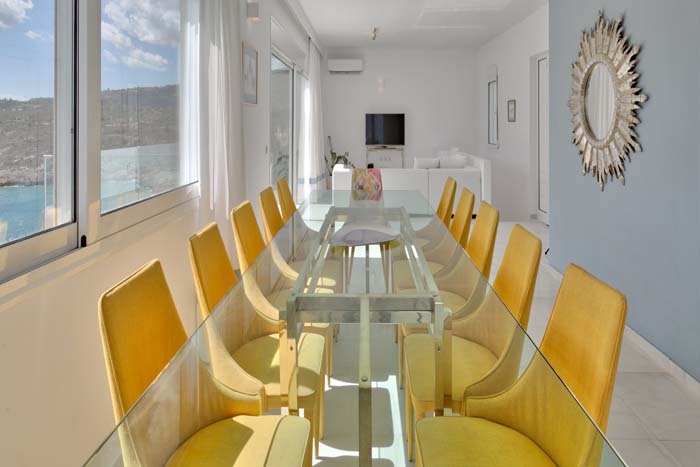 In the living room of the ground floor, in which white and coral colors prevail, there is a large ottoman sofa and a cast-iron table surrounded by a modern version of classic vienna chairs. 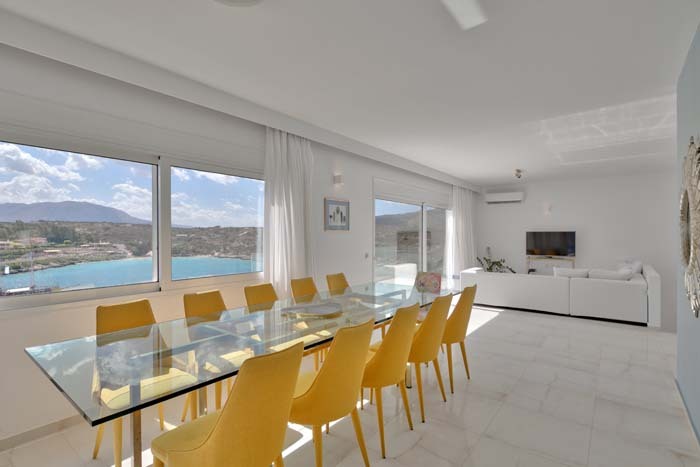 The tiled patio that can be accessed from this area and all of the four bedrooms that are on this floor leads on to lawns adorned with olive trees. 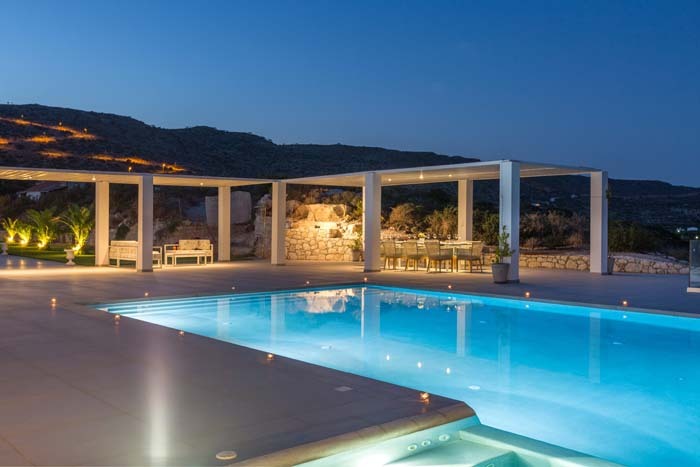 At the end of a private driveway stand imposing and awe-inspiring two-storey buildings surrounded by 3000 sq meters of land, which makes it ideal not only for accommodation but also for various celebrations for up to 300 people. 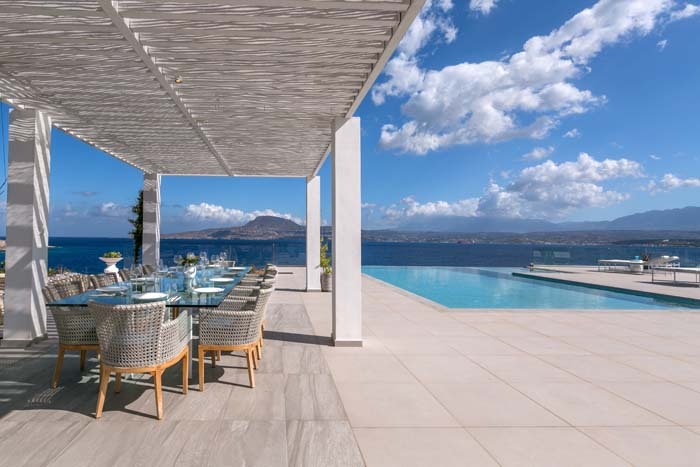 The outdoor area is characterized by simplicity and ambiences that relax you and help your mind drift to an exotic level. 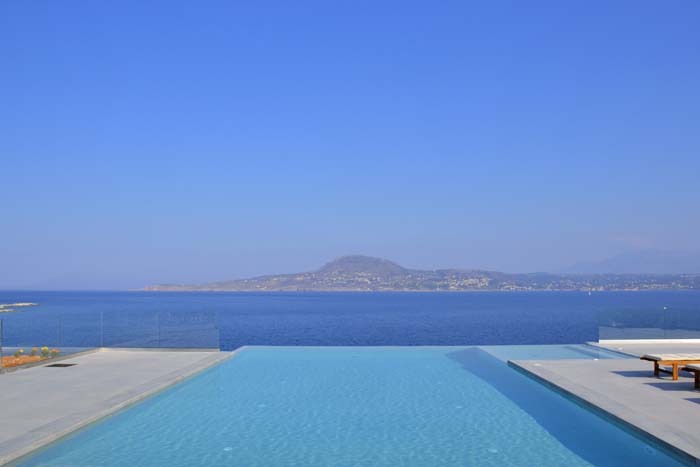 Guests are awed by the infinity of the sky and the sea that are in line with the refreshing aura of the 100sqm private pool and built- in Jacuzzi, the view of which can also be enjoyed under the shade created by the pergola and its intertwining fragrant jasmine. 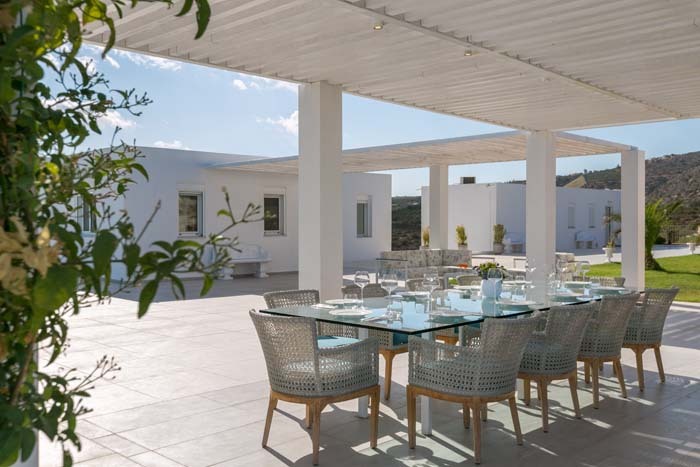 The outdoors can be relished either by sitting at the clean-lined table under the pergola or by lying on the sun-loungers by the pool. 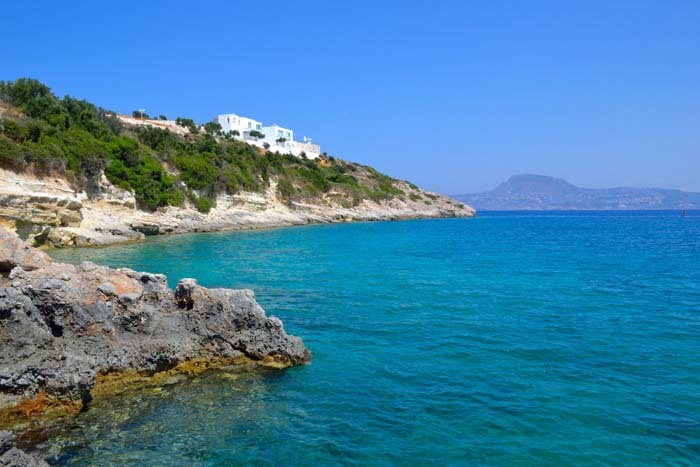 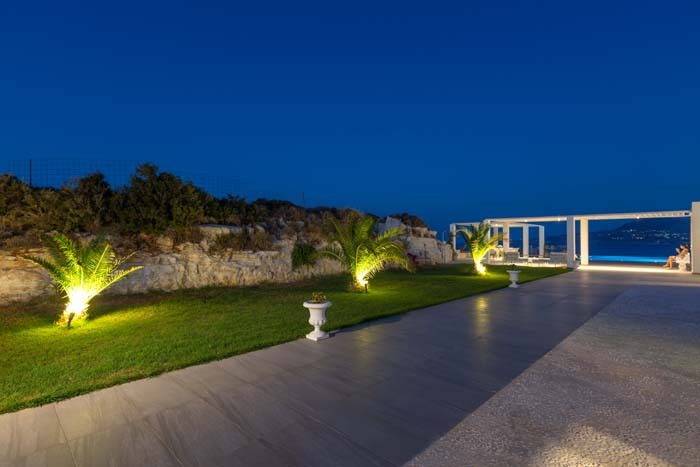 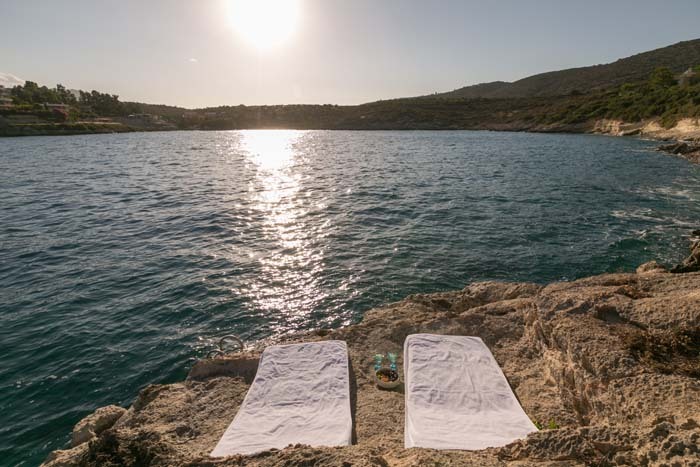 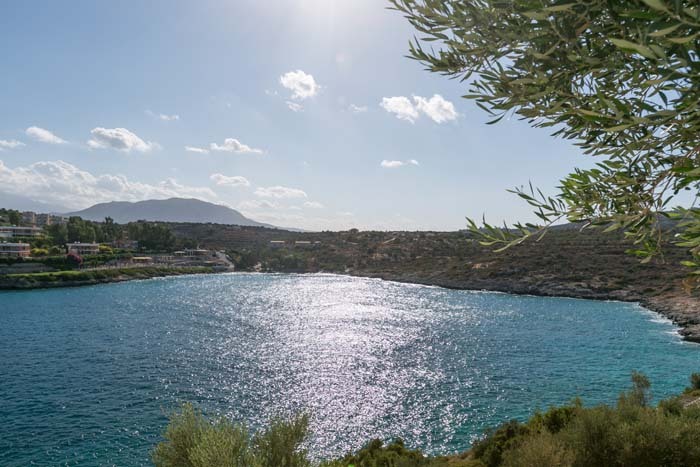 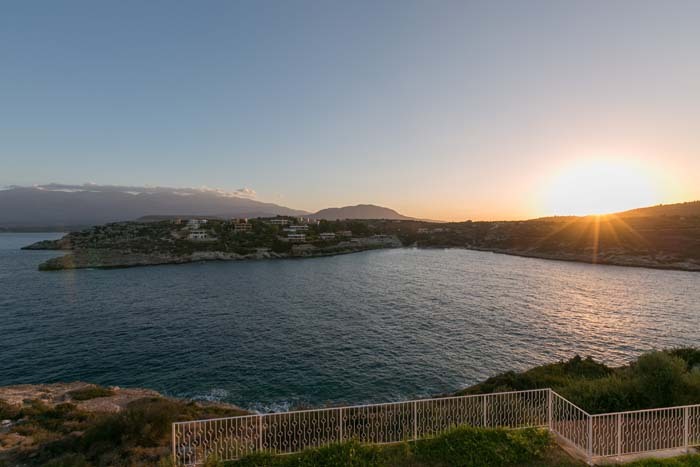 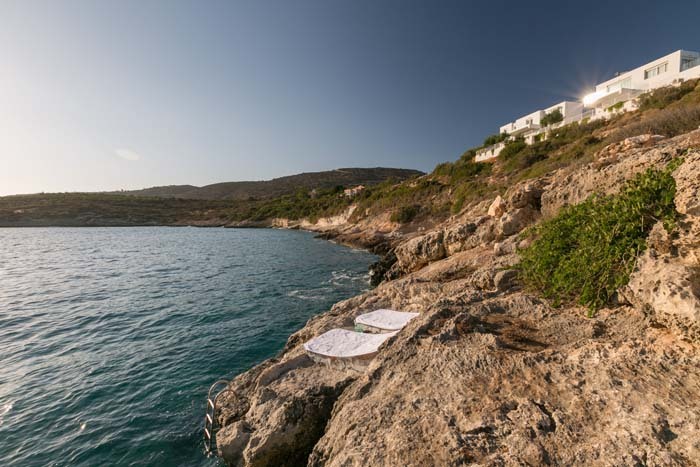 A small path leads from the villa to the rocky side of the Loutraki sea where guests can enjoy the crystal clear waters of sea. 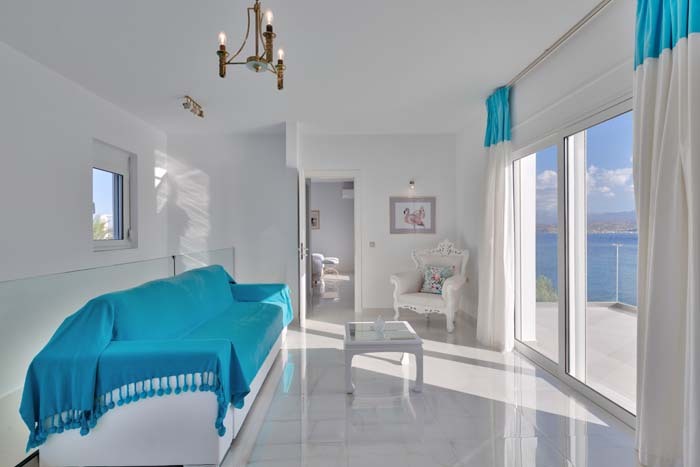 5% Discount for all bookings for 2016.